"This is a meal all by itself! It goes together in a snap using leftover cornbread and chicken." Mix ranch dressing and salsa together in a small bowl. 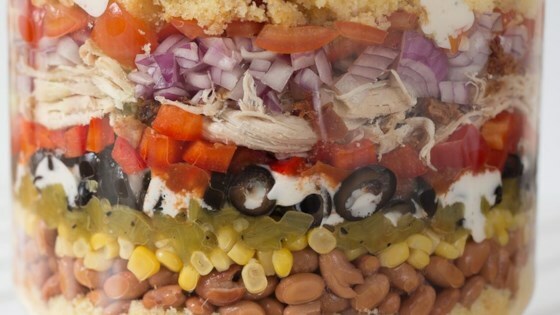 Layer 1/2 of the corn bread crumbles, pinto beans, corn, green chile peppers, and olives in a large bowl; cover with 1/2 of the dressing mixture. Layer bell pepper, chicken, bacon, onion, and tomatoes over dressing. Top with remaining corn bread crumbles and dressing mixture. Sprinkle Cheddar cheese on top. Cover with plastic wrap and refrigerate until flavors combine, 3 to 4 hours. Substitute frozen corn for the canned if desired. Use rotisserie chicken or canned chicken if desired. Easy to add what you like and remove what you don't!